Software-defined networking (SDN) is a critical component in modernizing your data center to meet new and growing customer expectations and demands. Trusted innovators Citrix and Cisco share a common vision for applying the concepts of SDN to simplify and automate data center and application networking to help their customers succeed. Using an application-centric approach to solve customer challenges, the two companies bring together Cisco’s IT leadership in connecting people, processes, data, and things and Citrix’s expertise in securely delivering apps and data to enable people to work better. Together, Citrix and Cisco provide measurable business outcomes with comprehensive solutions. Based on validated designs, these solutions are tailored to specific customer delivery models and use cases. 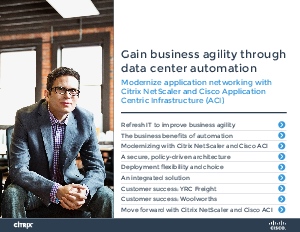 Cisco and Citrix have partnered to develop a leading SDN solution using the Citrix NetScaler application delivery controller (ADC) and Cisco ACI. This integrated solution automates application infrastructure, streamlines management, and improves scalability, security, flexibility. The result is faster application delivery, reduced deployment complexity, and better alignment between applications and dynamic business requirements for both existing and next-generation datacenters.